Editor’s note: The following is by no means a complete comparison of all available tablets; nor is it a comprehensive review of each of the tablet’s overall functions. The intent with this project was to look at features that would be relevant to someone looking for assistive technology features to help compensate for dyslexia. All references to the iPad in the article and sidebar notations are to Siri-equipped iPads. Over the past couple of weeks I have been lucky enough to review three of the most popular tablets—the iPad mini, the Nexus 7, and the Kindle Fire HDX. Instead of focusing on battery life, pixel density, and processor speed, I took a look at the features that would help people with dyslexia and other disabilities. All three tablets have some features that are perfect for dyslexics. To figure out the one that is right for you, think about which features are most important to you as you read the reviews. When looking for a tablet for someone with dyslexia, be sure to weigh a number of variables to make sure you get the features that are most helpful, and to get the best value, for your needs. First, you want to consider what the tablet will be used for. Will it be used primarily for reading books and browsing the web, or will it be used to type documents, read email, and edit movies? Generally, for people with dyslexia, it is essential that the tablet have built-in text-to-speech with a high-quality voice. All three of these tablets have text-to-speech, but the way it is implemented differs from tablet to tablet. The iPad allows text-to-speech to be activated in a few taps when reading webpages and text in other apps, including Safari, Mail, and many third-party apps, including The New York Times newsreader app. The other tablets require a more time-consuming process to activate text-to-speech in all apps. Next, app quality and quantity are also important considerations. Currently, the iPad is ahead in terms of app support, but the Nexus 7 is not too shabby in terms of third-party app selection either. Apple’s lead in terms of third-party app selection continues to narrow. See the ecosystem and apps section below for more information about app selection. If the person with dyslexia uses Bookshare or Learning Ally, it is important to make sure that the tablet has apps to support those services. Bookshare is an online library of digital books for people with print disabilities, and helpful to dyslexics, and Learning Ally provides audio books—some with text—for people with reading disabilities. Both the Nexus 7 and iPad mini have Bookshare and Learning Ally apps. The iPad’s apps for downloading and reading Bookshare books have many more features than the Nexus 7’s Bookshare app. The software that runs on the tablet is far more important than the shell on the outside, but you still have to be happy with the way your tablet looks and feels. The iPad mini is the largest of the tablets, yet it is easy to hold in one hand, though not as easy as the smaller Nexus 7 and Kindle Fire HDX 7″. The iPad mini has an all-metal and glass design that makes it feel worthy of its higher price tag. Both the Nexus 7 and Kindle Fire HDX have plastic backs that feel nice in the hand, but feel slightly less classy than the iPad mini. The look and feel of the back may not matter much for many users who use cases for protection. All of the tablets are remarkably light, so holding them for long periods of time should not be an issue for most people. People who plan to use the tablets for text-to-speech and audio books will need to give consideration to speaker quality, and where the speaker is positioned. For their size, all three of these tablets have good speakers. They all include dual speakers and have good sound quality. The Nexus 7 and Kindle Fire both have speakers on opposite ends of the device, which dramatically decrease the inadvertent blocking of the sound while being held, but the iPad mini’s speakers are both at the bottom of the device, making it possible, although not likely, that you might block the speakers depending on where you position your hands. While the placement of the speakers may not be an issue for you, the differences are worth noting. All three tablets have different operating systems, meaning their software behaves differently. 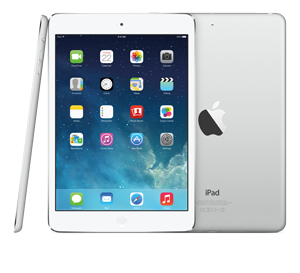 The iPad mini runs iOS 7 which is easy to use and smooth. iOS has the best built-in accessibility features of the bunch, with a well-polished screen reader called VoiceOver that can read almost anything on screen aloud using text-to-speech. iOS also includes Speak Selection which lets users highlight text and listen to it read aloud using text-to-speech. Android 4.4 KitKat which runs the Nexus 7 is another solid operating system. Without getting too much into the iOS vs. Android debate, the Android is a little less intuitive to use, but permits more customization than iOS. Android allows for home screen widgets—a widget is a small app that can run on the home screen—which, while useful, can also clutter the home screen and make it more confusing to use. Android also includes a screen reader called TalkBack, but it is not as polished as Apple’s VoiceOver. One of VoiceOver’s biggest advantages is that it works with more apps than TalkBack. The Kindle Fire HDX runs Fire OS 3.0, which includes a screen reader much like Android’s TalkBack, but requires you to use the Amazon ecosystem. So, if you buy a Kindle, you have to buy books, magazines, and apps from Amazon, which is limiting. 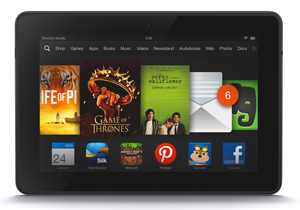 The Kindle Fire has an interface that is easy to use and puts your content at the forefront. Your apps, books, magazines, music, and movies figure prominently on the home screen for quick access. These tablets all have unique reading features that distinguish them from each other, but each of the devices allows users to highlight and annotate books, as well as define an unfamiliar word with just a couple of taps. 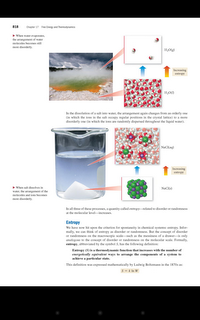 One of the best and most appealing features on the Kindle Fire HDX is called Immersion Reading. Immersion Reading syncs highlighted Kindle text with professionally narrated audio from Audible for a seamless and elegant reading experience. Immersion Reading gives you the best of both worlds by allowing you to listen to professional narration while following along with the text. The one negative of Immersion Reading is that you must own both the Kindle text version and the Audible audio version of a book. The costs can add up quickly if you use Immersion Reading frequently. The Kindle Fire HDX also allows you to read select books using text-to-speech. The text-to-speech voice sounds good—better than the Android and iOS default voice—but you can’t speed up the speaking rate. Those who use Kindle Fire would say the biggest downside of the iPad is the synthetic voice that reads back to you. The human voice capability and ability to link text and audio version of the book is the most attractive feature for my students—so much so that my students have sometimes purchased a Kindle (despite having iPads) for the reading because the experience is so profoundly different. They also love the highlighting that the Kindle does, but they would give that up to have the human voice. Voice Dream Reader, another app that can read Bookshare books. The iOS apps generally have more customizable user interfaces and more advanced annotations options. The Android Bookshare app, GoRead, is more simple and lacks some useful annotation options that are present on the iPad. The iPad has the best third-party app support for reading. Users of Bookshare and Learning Ally can read their books with great iPad-optimized apps. The iPad app Voice Dream Reader lets you read many documents and books, including Bookshare books, using text-to-speech. Voice Dream is the best text-to-speech app for mobile devices right now and is only available for the iPad and iPhone. The iPad can access Kindle books using the Kindle app and they can be read aloud with text-to-speech using VoiceOver. However, VoiceOver does not highlight the words as they are spoken. Apple’s own iBooks app underwhelms in terms of accessibility features for people with dyslexia. iBooks can be read with text-to-speech using VoiceOver, but VoiceOver does not highlight as it reads and it takes time to learn how to use it properly. The iPad’s Speak Selection feature makes it easy to read webpages, emails, and documents using text-to-speech. To use Speak Selection, just highlight the words you want read aloud and press speak. Speak Selection can also highlight words as they are spoken so you won’t lose your place in the text. All of these tablets have other useful features; both the Kindle Fire HDX and Nexus 7 include comprehensive multi-user support. On the Nexus 7 you can create a separate account for a student or child that only allows them to use certain apps on the device. Even if multiple users use the same apps, they can each set them up the way they prefer. Kyle Redford explains how using text-to-speech can help students with their writing assignments. The Kindle Fire HDX includes Amazon Free Time which can restrict the time your child or student can use the device for certain tasks. For example, you could permit only 30 minutes of video watching, but give time for unlimited reading of a Kindle book. Amazon Free Time also lets adults limit which apps and content are available for children. The iPad has a similar feature called Guided Access, but you can only allow the child to use one app at a time using the Guided Access feature. All three tablets also include speech recognition that allows you to speak into the tablet and then have your words appear as text. The Nexus 7 and Kindle Fire HDX allow you to dictate even when you are not connected to the Internet. The iPad does require an Internet connection in order to use dictation. The Kindle Fire HDX includes a really cool feature called Mayday. If you are having trouble doing anything with your Kindle Fire HDX, you can press the Mayday button to be connected with a live Amazon agent in about a minute. You can see the support agent’s face, and he or she can see your Kindle Fire’s screen. They can then walk you through the steps needed to resolve your difficulties. I found the support staff knowledgeable and able to help out quickly. Mayday is how tech support should always work. It’s important to consider the ecosystem of each tablet. The ecosystem determines which apps, books, magazines, and songs are available for your device. The iPad has the best app selection, especially for assistive apps. To see a list of the apps I use as a dyslexic student, click here. The Nexus 7 utilizes the Google Play store for apps, and its offerings are solid. Currently, you will not find all of the top assistive apps on the Nexus 7, but you will likely find almost all of the big-name apps. The Kindle Fire HDX has good app support, but it falls behind both other tablets. The Kindle is locked into Amazon’s ecosystem for all apps and books, while the other tablets can download content from multiple sources. All of the tablets have solid reading features for people with dyslexia. Which tablet would be best for you, your students, or your child? If using Bookshare or Learning Ally on the tablet is important to you, you should not consider the Kindle Fire HDX. Both the Nexus 7 and iPad support Bookshare and Learning Ally, but the iPad apps offer a better experience for using these services. If you’re not a Bookshare or Learning Ally user and have money to spend on Immersion Reading books, the Kindle Fire may be the best option for you. Just keep in mind that the Kindle does not have quite the app selection of the other tablets. If you want a full-featured tablet and you’re on a budget, the Nexus 7 is a very good option. If you have the money to spend on the iPad, with its unmatched app selection and robust built-in accessibility features, it is your best bet. Brian Meersma is a dyslexic high school senior from New Jersey. Brian uses assistive technoloy both in and out of school to help him read and write. Brian presents about different assisitve technologies to parents, students and educators. He also maintains an assistive technology blog (bdmtech.blogspot.com). This tool captures writing and records audio.